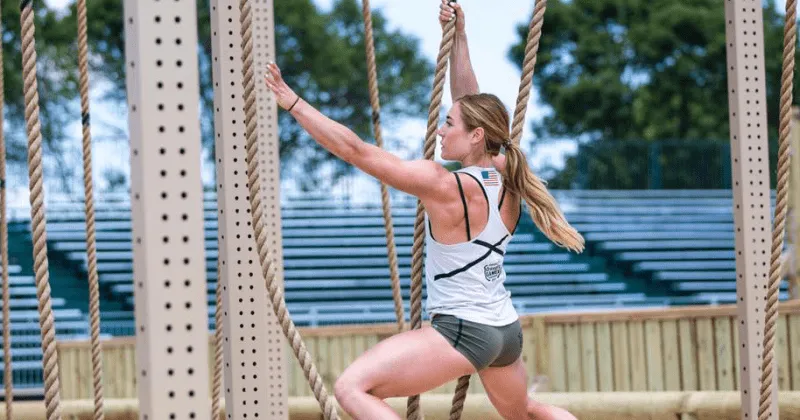 Despite winning The Games and the (weightlifting event) Muscle Up Clean Ladder, Tia-Clair Toomey is the joint lightest female competitor at 58 kg (128 lb). 150,000 lbs of bumper plates were used at The 2017 CrossFit Games. 75,000 lbs of barbells were used. Lynne Knapman is the only Masters Athlete to qualify for The CrossFit Games every year since the inception of The Masters competition in 2010. She qualified in 2017 to extend her streak to eight consecutive years. The average weight of individual males is 193 lb. The average height of individual males is 5′ 10″. The average weight of individual females is 142.7 lb. The average height of individual females is 5′ 5″. The oldest individual male competing at the Games is Josh Bridges at 34. The oldest individual female competing at The Games is Val Voboril at 39. The Youngest male Individual competitor was Tommy Vinas at 20 years old. The Youngest Female was Madeline Sturt, also 20 years old. Saturday during the CrossFit Games was Val Voboril’s Birthday, where she turned 39. Mary Schwing (65) is the oldest female competitor at The Games for the second year in a row. Tallest Individual female was Kirsti Pedri at 5’9″. Tallest Individual males were Brent Fikowski and Garrett Fisher, both 6’2″. Shortest Individual female was Emily Bridgers at 5’1″. Shortest individual male was Dakota Rager at 5’4″. Heaviest Individual males were Tim Paulson and Brent Fikowski at 215 lbs. Heaviest Individual female was Whitney Gelin at 165 lbs. Lightest Individual females: Kristi Eramo and Tia-Clair Toomey at 128 lbs. 11 different countries are represented by Individuals. 8 countries are represented by Teams. 19 countries are represented by Masters. 18 Countries are represented by Teenagers. 30 Countries are represented in total across all divisions.